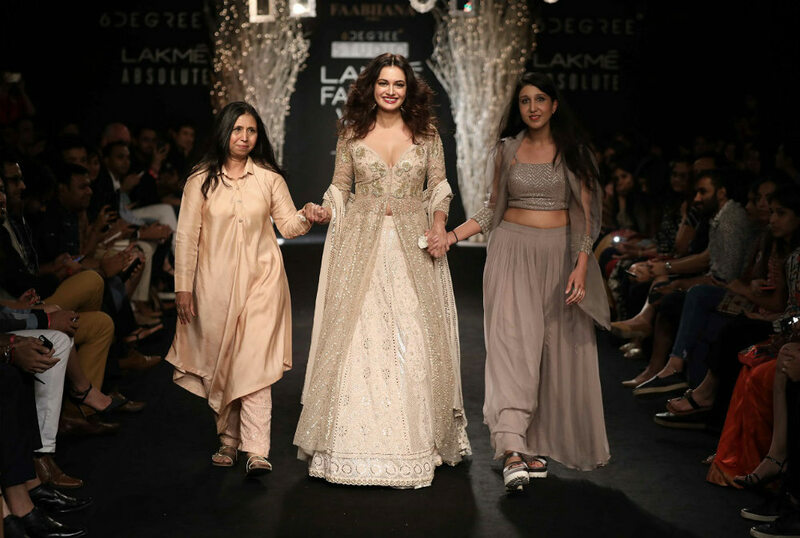 Day 05 – Lakme Fashion Week Winter/Festive 2017 comes to a grand close - Wedding Affair var admin_url = "https://weddingaffair.co.in/wp-admin/"
On day five (the last day) of the Lakme Fashion Week Winter/Festive 2017, Nancy Luharuwalla’s label ‘De Belle’ showcased its women’s wear collection “Allure By De Belle” at the 6Degree Studio. The collection was inspired by the early 1950s and saw ensembles that had merged Western and Indian designs together. 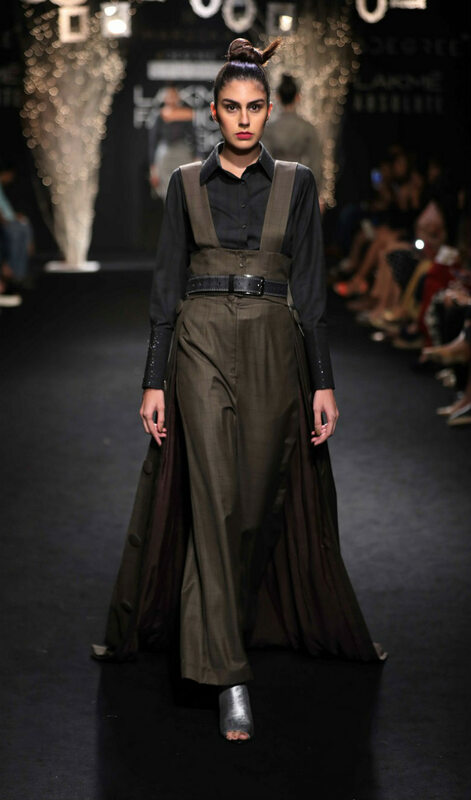 With a hint of retro added into the mix, the collection comprised of trench coats, boleros, waistcoats etc. The beautiful and breath-taking Illeana D’Cruz played showstopper in black ballgown with embroidery on the hem of the gown. Also on the concluding day of this grand event, Kusum and Karishma Luharuwal’s label “Faabiiana” unveiled its “Desert Rose” at the 6Degree Studio as well. The ensembles were crafted with the use of interesting styles and silhouettes and it was a mélange of maxi-flared dresses, structured suits, jackets and even blouses. Lovelier than ever before, Bollywood’s sweetheart Dia Mirza graced the runway as a showstopper for the collection in an embroidered, ground-hugging Chikankari jacket and ghaghra with elaborate Gota work. Taking Ramayan’s central characters ‘Sita’ and ‘Draupadi’ as her muse, Hardika Gulati showcased her highly inspired collection at the 6Degree Studio. The ensembles had a very 1960s look and feel to it while simultaneously belonging to the future. Jumpsuits, ruffles and added glitter gave the outfits that extra avant-garde look. The “MS Dhoni” fame Kiara Advani wore a body hugging black dress with a cape that trailed on the floor as she walked down the runway with grace and confidence. “Ruceru”, the label from Ruchi Roongta and Rashi Agarwal unveiled their collection “The Fallen Leaves”. To celebrate woman, the collection sought inspiration from nature. The concept of “growth and fall” was translated into the ensembles on show. Re-imagined lehenga and saree styles were the most striking pieces of the collection. The style theme they stuck to was vintage, which gave the ensembles a very classic look but they had also added their own personal touches to their outfits. 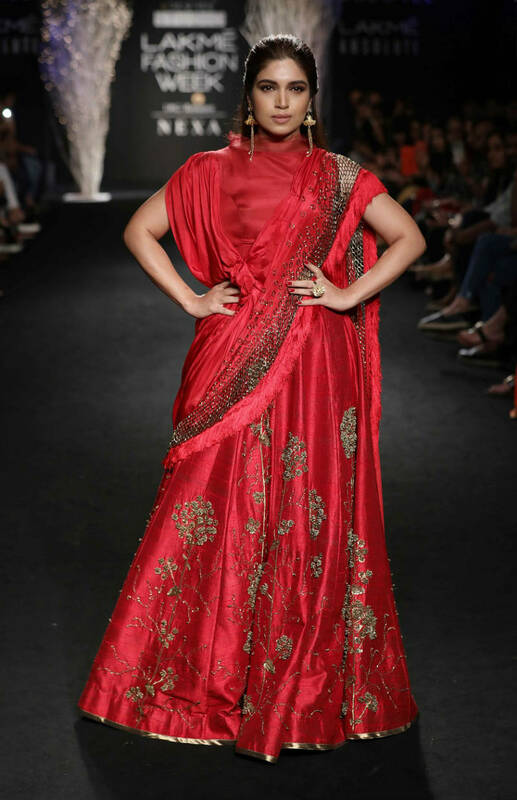 Bollywood actor Bhumi Pednekar sashayed down the runway in a red, floral, embroidered Ghaghra as the showstopper and stole the hearts of many. Designer Narendra Kumar is known not only for his out-of-the world designs but also for all the drama he brings to the ramp. The ramp acts as his playground and the audience are left enthralled. This time around, for Lakme Fashion Week, Kumar invited everyone to the wedding of a lifetime – The wedding of Shayla Patel – his imaginary muse. The runway was illuminated with an audio-visual treat for everyone present in the room. The collection was a mélange of outfits for the bridal entourage. The whole event was divided into several chapters and each chapter revealed different variations of his creations. Pleated kurtas, jumpsuits with floral prints, peplum jackets, scalloped embroidered gowns, flared pants and velvet gowns were some of the most gorgeous pieces in the entire collection. No fashion event is complete or justified without the man himself, Manish Malhotra. On the final day of the event, NEXA, the premium retail experience outlet of Maruti Suzuki India Ltd joined hands with the designer. The collection was a delight to the eyes and the sartorial world in general as it laid emphasis on the Indo-Western style. 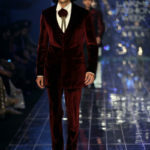 Long velvet coats, lapel jackets with embroidery, ornate lehengas, slit gowns and corsets were the most eye-catching outfits of his collections. 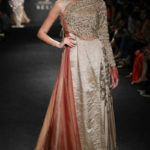 The dresses and structured coats had an element of edgy haute couture on them, which has been Malhotra’s signature style. 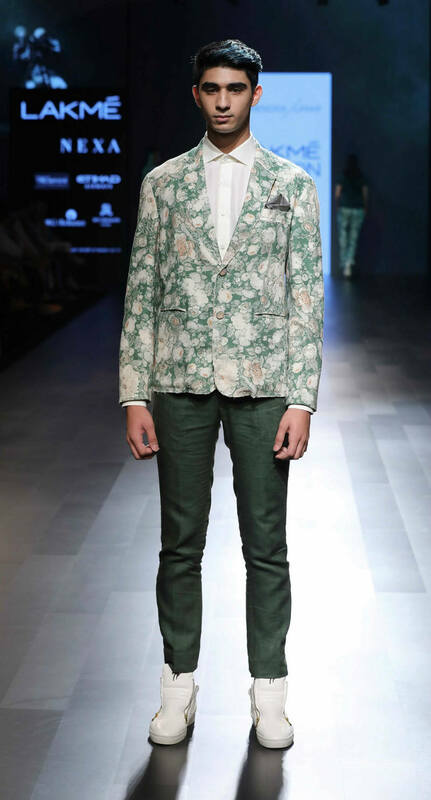 To add icing on the cake, Bollywood’s most attractive man Aditya Roy Kapoor strutted down the runway in a black, velvet one-button jacket with a contrast black embroidered lapels along with the absolutely beautiful Jacqueline Fernandez who came decked in a long-sleeved, embroidered, net floor-skimming creation, over micro shorts, which showed off an intensely fantastic beaded back and black tulle stole. 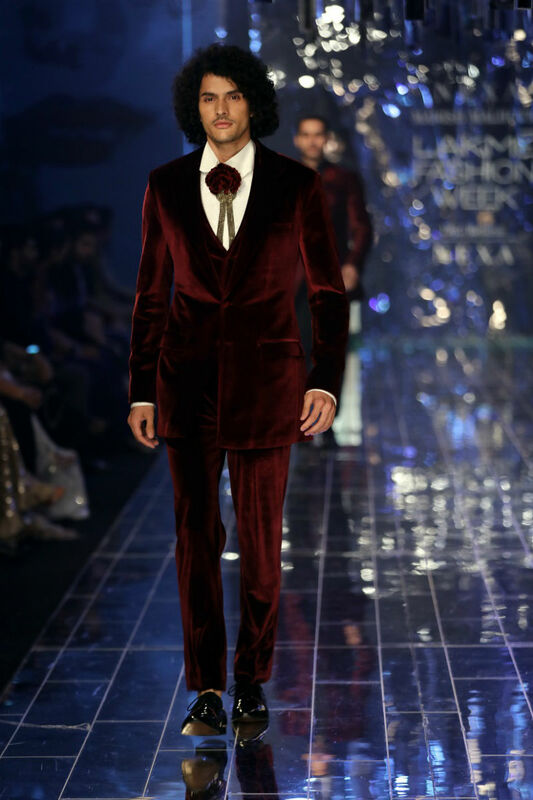 The Closing Show, ‘Tales of Indulgence’ by India’s leading designer Manish Malhotra was truly a heart stopping sartorial experience of fashionable desires at Lakmé Fashion Week Winter/Festive 2017. 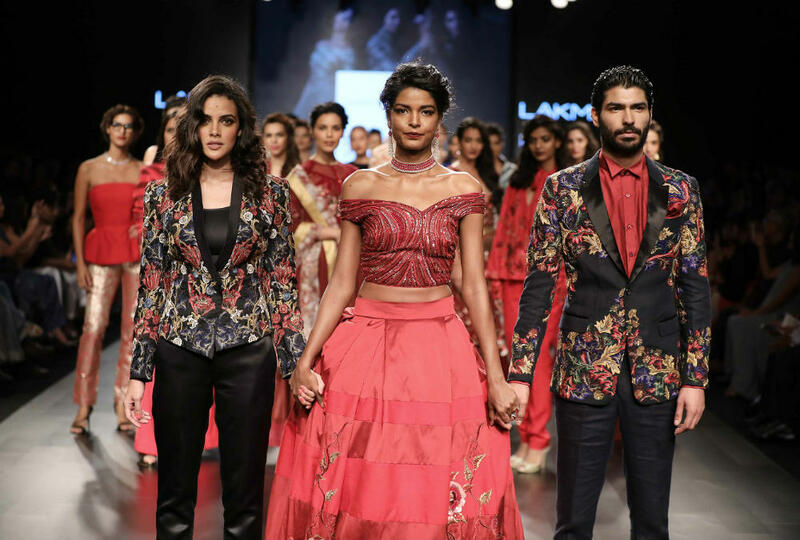 Previous articleDay 05 – Lakme Fashion Week Winter/Festive 2017 Concludes With A Big Bang! 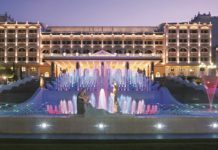 Next articleCrowne Plaza Bengaluru Electronic City: Why Stay Anywhere Else?